The Children’s Center of Austin builds its program on the premise that each child is a unique individual with a definite growth and developmental pattern. We are committed to the belief that early childhood education is vitally important to our children’s future. The Children’s Center of Austin is a safe and vibrant place you can feel good about bringing your child to each day. 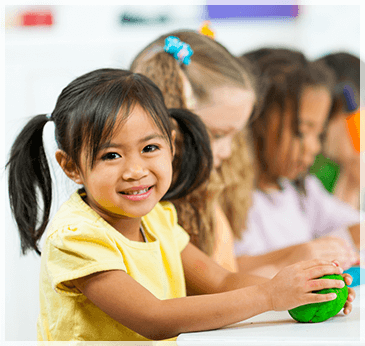 The Children’s Center of Austin offers a varied educational environment in which children continually learn new skills and accomplish new goals – all the factors that make early childhood education fun and establish the keys to future success. The curriculum design at The Children’s Center of Austin is developmentally based and focuses on the individual child’s social, emotional, and intellectual needs. Our professional staff encourages individual exploration and growth in a well-equipped environment that is stimulating, safe, consistent, and nurturing. We strive to encourage each child’s natural curiosity in the hopes of fostering a love of learning. Your child’s experience at The Children’s Center of Austin is filled with opportunities to master the tasks that are appropriate for his or her developmental level. In addition to an exemplary curriculum, The Children’s Center of Austin is committed to working closely with parents for the welfare of the whole family. Parents are welcome to visit at any time. At The Children’s Center of Austin, we believe our task is to provide the children in our care with love, security, and the opportunity to grow.